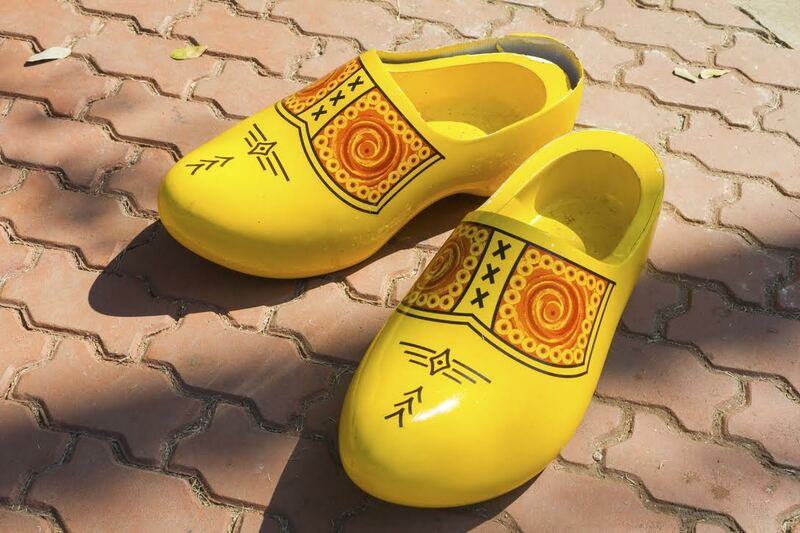 Klompen, or wooden shoes, are a well-known Dutch tradition, much like tulips and windmills. Exactly when the first wooden shoes were created and by who is a mystery, and will more than likely remain so forever. The oldest wooden shoe ever found was discovered in Amsterdam in 1979 and dates all the way back to 1230 AD. The first actual guild of clog craftsman in Holland was founded around 1570. Prior to the 16th century, most people wore no shoes at all. Shoes were expensive and worn only by the rich to protect their feet and prove that they could afford such a luxury. Hence came about Klompen, a shoe made of wood that was a cheaper, safer alternative to hand-stitched leather shoes. The early versions of wooden shoes featured wooden soles and leather tops, however eventually the entire shoe was made of wood to better protect feet, as many people who wore them were fisherman, farmers, and factory workers. Wood shoes offered a barrier from dangers such as fishing hooks, nails, and other sharp objects tradesman came in contact with on a daily basis. Klompen are a symbol of Holland that Dutch people are slowly moving away from. Farmers, gardeners, tradesmen, and fishermen in the countryside make up the majority of Dutch people who still wear the traditional wooden clogs nowadays. Most people that purchase wooden shoes today are tourists. Travelers who visit Holland want to take home something ‘typically Dutch,’ and with today’s airline regulations, Klompen is easier to transport than cheese and tulips. There are doctors that claim that the typical wooden shoe is healthier for people to wear than shoes worn today. One reason is that the clogs act as an air conditioner for your feet! The wood absorbs perspiration, which keeps feet nice and dry (great for local Dutch farmers who walk around in mud all day!). Klompen are even safer than steel-toed boots in most settings. They crack instead of dent when struck by an object which protects the foot and allows easy foot removal from the damaged clog. Watch out for splinters though! While most wooden shoes are now made by machines in factories, it used to take 3 hours to make one pair of shoes by hand! As a custom, young Dutch men used to present their fiancées with new wooden shoes as an engagement gift. Klompendanskunst, or Dutch clogging, features a lighter wooden shoe made especially for this type of dance, which involves dancers creating a rhythm by tapping their toes and heels on a wooden floor. The soles for this special type of shoe are made of ash wood, and often taps are attached to both toe and heel to create a more prominent sound. Every year in June, The American Baseball Foundation of the Hague sponsors an American-style baseball game where both teams play in clogs! This entry was posted on Thursday, May 29th, 2014	at 1:24 pm	. You can follow any responses to this entry through the RSS 2.0	feed. Both comments and pings are currently closed.